Tim Tebow was a college football champion, Heisman trophy winner, drafted in the first round of the 2010 Draft. Then he had a miracle playoff run with the Denver Broncos before being traded to the New York Jets. After one season he was cut by New York. Next he was signed by the New England Patriots then let go after training camp—a scenario that repeated itself the following summer with the Philadelphia Eagles. Tim Tebow has achieved big victories and plunged the depths of failure, all while never letting go of his faith, even in the face of doubt and disappointment. So, as hard as it may be to believe, I’d never heard of Tim Tebow before reading his book. I didn’t know he was a football player or a celebrity. (Even my wife knew he was!) I never heard of Tebowing – the act of dropping to one knee and praying during a sporting event. (Even my seventeen-year-old son knew about that.) So I read his book Shaken: Discovering Your True Identity in the Midst of Life’s Storms without any preconceived notions whatsoever. I stumbled across it in Barnes & Noble while looking at the shelves containing The New York Times Bestsellers – I saw the title and am always on the hunt for motivational and inspirational books. The dust jacket described how a top athlete’s life was shaken to its very core and how he had weathered the storm; it seemed a worthwhile investment to help cure some of the malaise and stagnation that I’ve have recently felt in my own career. Now I have come to learn that Tim Tebow is known worldwide from his college football days; he’s a two-time national champion, a first-round NFL draft pick, a humanitarian, a public speaker, a bestselling author, and founder of the Tim Tebow Foundation. Probably most important of all, however, is that I also discovered that Tim Tebow is a highly competitive, sincere, passionate individual who speaks from his heart. Shaken is a rubric for weathering life’s rollercoaster rides of ups and downs. There is a saying about how you had better be kind to the people going up the ladder because you’re going to see the same ones on your way down. As Shaken points out, fame – like money and looks – is transitory. 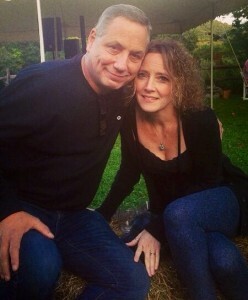 What’s lasting is the legacy that you leave; the legacy that you build in life via helping and loving others. While the book may not be unique and/or original in its advice, themes, or guidance, Tebow’s narrative style makes his points poignant and palatable. 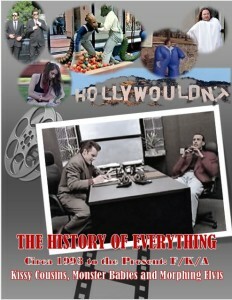 Indeed, it’s a quick, easy read that keeps you engaged. From an organizational standpoint, Shaken is well-written and scores countless touchdowns with its readers (sorry, couldn’t help the pun!). 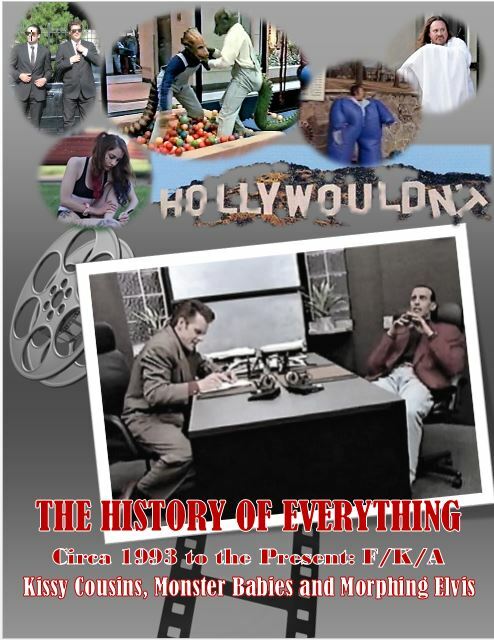 The book opens as he is cut from the New England Patriots; this devastation sets the stage and foreshadows both his later victories and triumphs. But this isn’t just a run-of-the-mill comeback story. 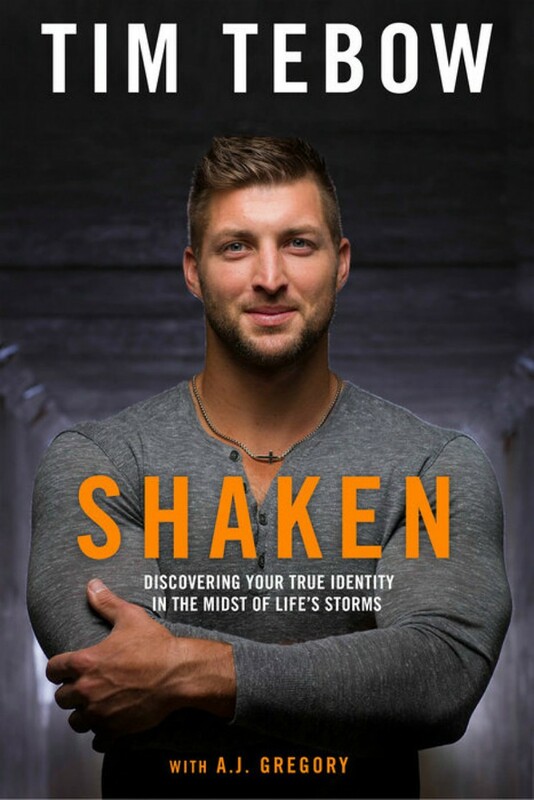 Tebow smartly peppers his chapters with case histories of real people who are struggling with life-and-death issues. The overall effect is both instructive and motivational. I must say that as his life is so vastly different from mine, it is a bit tougher for me to empathize with Tebow’s passing up a chance to make a million dollars in one day for a commercial. Or when he was cut from one team as a quarterback only to get offers from other NFL teams for other positions. While I can understand that disappointment, like all other feelings, it is both subjective and relative; however, I was more empathetic for the cancer-stricken young teen who had her appendix, uterus, ovaries, spleen, colon, gallbladder, and most of her small intestine removed, yet still persevered and refused to be a “victim of cancer.” It was stories like that which gave Shaken much of its power and strength. Tebow’s passion for Christianity is interwoven throughout his narrative, but I never felt that he proselytized nor did I feel smothered by religious pedagogy. But when bad things happen to good people and we then find ourselves questioning our faith, Tebow is realistic and pragmatic enough to note that our questions “may be answered on this side of heaven, or they may not be.” As a corollary, Tebow preaches that while God has a master plan for each of us which we may never understand in our lifetime, “don’t let that stop you from fighting the good fight and keep the faith.” Quoting Pablo Picasso, Tebow states that “action is the foundational key to success.” Tebow’s emphasis on action reminded me of another motivational writer, Anthony Robbins, who used to say while you can’t worry about everything in life, if you never weed your garden, eventually the weeds will take it over. While there are many Bible quotes, they all are adroitly used to illustrate and support the themes and points made in the book. My favorite story involves how Tebow would reference Bible quotes in his football eye black (glare-reducing grease). In 2009, he wore “John 3:16” that describes how God gave us eternal life through Jesus on his eye black during the National Championship game. Apparently, ninety-four million people Googled “John 3:16” during the game. What was even more astonishing, however, was that three years after wearing “John 3:16” (and after the NFL forbade personalizing eye-black), Tebow and the Broncos defeated the heavily favored Steelers 29 to 23. After the win, a reporter brought to Tebow’s attention that the game was exactly three years after he wore “John 3:16.” During the game, Tebow threw for 316 yards; his yards per completion were 31.6; and the ratings for the night were 31.6 million! That kind of stuff syncs with my own beliefs that there are no coincidences and sometimes the universe truly does converge. 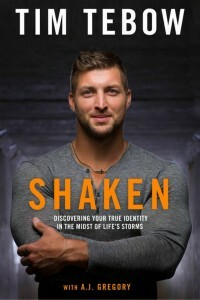 Tebow collaborated on Shaken with veteran, best-selling writer, A.J. Gregory, whom Tebow thanks in his acknowledgments. Overall, Shaken accomplishes what it sets out to do: it inspires, motivates, guides, educates, and entertains. I look forward to reading other works by Tim Tebow – at least now I know who he is!